Elwin Orton, a researcher at Rutgers University, was responsible for breeding and introducing new native dogwoods that could better withstand attacks from insects and pathogens. Dr. Elwin Orton started a long, successful career breeding better plants at Rutgers University in 1960. When he retired from the university 48 years later, he had explored new avenues of investigation, changed the nursery “landscape” across the country, and saved the dogwoods. Orton’s early efforts at Rutgers targeted holly, combining the winter hardiness of Ilex opaca with the ornamental characteristics of I. aquifolium to produce better foliage and berries for the cut sprig market. His work eventually included 18 different Ilex species. “But man cannot live by Ilex alone,” Orton said. Cornus florida, the iconic native flowering dogwood of the East Coast, was under attack by the dogwood borer. “Some growers used to spray for the borer three or four times a year with DDT,” Orton said. Powdery mildew was a problem for dogwoods, too. In the 1970s, dogwood anthracnose, a disease caused by the fungus Discula destructiva, compounded the difficulties. Both C. florida on the East Coast and C. nuttallii, the Pacific dogwood native to the West Coast, were falling victim. “Some thought it might be the end of the native dogwoods,” Orton said. Instead, he expanded his breeding to search for dogwoods capable of withstanding insects and disease. Orton had a novel idea to save the native American dogwoods. He focused on a dogwood native to Asia, C. kousa, a species with superior resistance to pests and disease. A successful cross between C. florida and C. kousa had never been accomplished, and the two species bloomed a month apart: C. florida in early May and C. kousa in early June. Undeterred, Orton started assembling all dogwoods available in the trade. Since dogwoods are self-incompatible, a “tremendous genetic variability exists in each species,” Orton explained. Selections can be made for shape, vigor, size, brighter white bracts, red bracts or bracts tinged with pink. With more variation in the parent plants, he could expect more variability from the crosses. Orton collected pollen from earlier blooming C. florida trees and stored it at zero F. When C. kousa bloomed a month later, he warmed up the pollen and manually pollinated those trees using a toothpick. Since dogwoods mature slowly, after five to seven years as juveniles, the selection process was very slow. Years of trials involving thousands of hybrid seedling dogwood crosses proved worth the time and effort. After a quarter century evaluating experimental hybrid trees in various climates, retesting new hybrid trees with old standard dogwoods, and reconfirming performance, the first group of Orton’s interspecific dogwood crosses, the Stellar series, reached the market in the early 1990s. Highly resistant to dogwood borer, with significantly improved resistance to powdery mildew and dogwood anthracnose, and better drought tolerance, these selections ushered in a new era for dogwoods in the landscape and nursery industries. Trees in the series bloom midway between the two parent species. Although the U.S. plant patents have now expired on Aurora, Constellation, Celestial, Stellar Pink, Stardust and Ruth Ellen, they are still trademarked and sell well across the country. “Stellar Pink with pink bracts has always been the leader in sales,” Orton said. Orton also discovered a true genetic dwarf form of C. florida, which was named Red Pygmy® (C. florida ‘Rutnut’) and released to the commercial market in 1993. A shrub form for small spaces, Red Pygmy produces typical C. florida flowers that are dark pink to red on a much smaller plant. Dense branching and side branches together produce a mounded effect. According to Eric Hammond, production manager of Heritage Seedlings in Salem, Oregon, Red Pygmy is very popular on the East Coast where it performs admirably. Its showy golden orange fruit makes an outstanding display. What about crossing C. kousa with C. nuttallii? Such crosses might also produce good results, Orton hypothesized. He was right. After years of hybridizing and field testing, the hybrid Jersey Star® series of crosses using F1 C. kousa and C. nuttallii seedlings was released by Rutgers in 2004. These new varieties, Venus® (Cornus × ‘KN30-8’) and Starlight® (Cornus × ‘KN4-43’), took dogwoods to a new level. Both are extraordinarily robust and distinguished by very large, attractive white flowers. Venus produces huge floral bracts, usually 6–7 inches across — sometimes even bigger. “The ginormous flowers are phenomenally beautiful,” Hammond said, and the trees have great vigor and disease resistance. 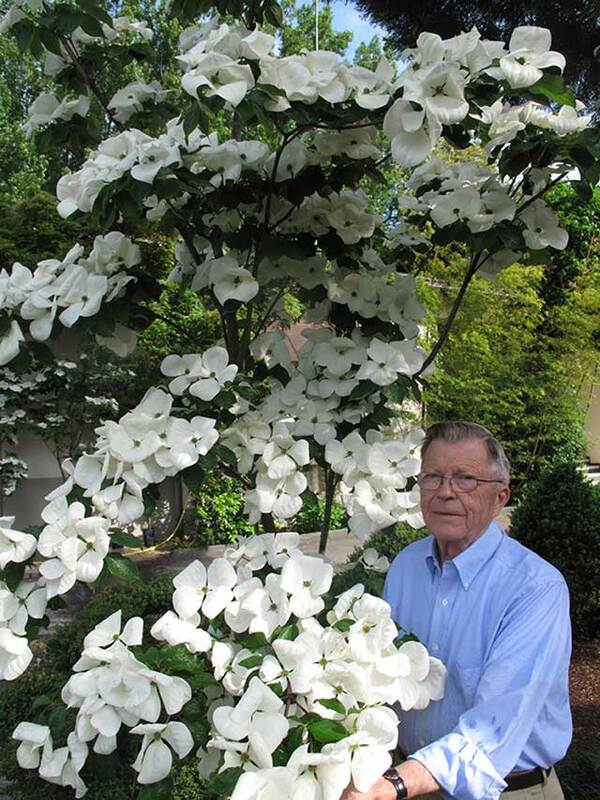 J. Frank Schmidt & Son in Boring, Oregon, grows dogwoods from Orton’s work at Rutgers and others of interest. Communications director Nancy Buley finds the C. kousa and C. nuttallii crosses of particular interest for sites in the Pacific Northwest and very popular in other regions of the country, too. The huge bracts make Venus very showy in bloom, making it the runaway best seller of all the Rutgers hybrids, she added. As many Venus dogwoods are grown as all of the other Rutgers hybrids combined. The plant grows vigorously with low branching that forms a rounded head that is wider than tall. Sparse fruit production adds to the desirability of Starlight as a commercial landscape tree, Buley said, as evidenced by its use in a recessed courtyard of the newly remodeled Edith Green/Wendall Wyatt Federal Building in Portland, Oregon. Venus dogwoods also produce little to no fruits. Dr. Tom Molnar joined the team at Rutgers in 2005 and took over control of dogwood breeding when Orton retired in 2008. An associate professor in the Depart-ment of Plant Biology and Pathology, Molnar continues to work towards the same goals that guided Orton. “In 2005, we started making crosses on many different unreleased hybrids and species dogwoods to develop large populations of new and unique plants to select from and to use in later generations of breeding,” Molnar said. While Orton might not have developed a true red-bracted C. kousa, he built an amazing legacy of breeding parents to use for future improvement efforts. “I consider myself very lucky to have his over 40 years of dogwood breeding — some pedigree records go back four and five generations — to support our continual effort today,” Molnar said. Orton’s new release, Rosy Teacups®, has attractive medium-pink bracts. Hammond described it as a “very fine hybrid from Dr. Orton” and added that the C. kousa × C. nuttallii hybrid is superior to any reds on the market. A favorite at Heritage Seedlings, “Rosy Teacups has great vigor, disease resistance and bracts that are consistently pink.” According to Hammond, the consistency is an improvement over another pink, C. kousa ‘Satomi’, that has been a top seller for decades. The pink of Satomi’s bracts is more variable depending on specific annual conditions, whereas Rosy Teacups performs consistently. Meanwhile in North Carolina, recent dogwood breeding has been supported by a partnership between North Carolina State University (NCSU) and the North Carolina Nursery and Landscape Association (NCNLA). “Our work has been taking a different angle,” according to Dr. Thomas Ranney, professor in the Department of Horticultural Science at NCSU. Researchers there have been experimenting with many different ever-green dogwood species including C. hongkongensis. “The evergreen species tend to contribute great foliage quality, disease resistance, heat tolerance, and the capacity to root more easily from cuttings. By hybridizing these with more cold-hardy deciduous species including C. kousa, we can get the best of both worlds,” Ranney said. Little Ruby™, the first hybrid dogwood to be released, is a great example. A compact plant that can be grown as a shrub or tree, Little Ruby has excellent disease resistance and roots from cuttings. Pink flowers vary from single to double (with extra bracts), and the foliage has an attractive red blush in summer then turns a brilliant maroon in fall and winter. It is semi-evergreen to 15 F.
Heritage raises many dogwood species and budded hybrids of which C. kousa rootstock and seedlings are in high demand. Hammond also recommended a new selection of C. elliptica for more mild areas — Empress of China (C. e. ‘ELSBRY’), which is hardy to USDA Zone 7. Popular in the Southeast and California, the vigorous evergreen selection blooms in late summer. A J. Frank Schmidt introduction from still another species, C. controversa ‘June Snow-JFS’, has been gaining acceptance and popularity. Reminiscent of the layered Pagoda Dogwood (C. alternifolia), June Snow™ is bigger and more vigorous with an attractive, spreading structure. Even in winter, the tree has loads of character thanks to its alternately layered branching habit that resembles the popular, but difficult-to-grow, wedding cake tree (C. controversa ‘Variegata’). Large (5–6 inches), flat-topped flower heads made of many tiny flowers, rather than bracts, smother the lateral branches “like sea foam” in the spring, Buley said. These are followed by tiny, attractive, black-purple fruits that are favored by birds. With clean, disease-resistant foliage, June Snow is handsome in all seasons, its exceptional fall color and red/purple brown bark and stems decorating the tree in fall and winter. June Snow was chosen as a Great Plant Pick for its performance in Pacific Northwest gardens, as was another dogwood recommended by Buley — C. kousa var. chinensis ‘Milky Way’. This selection also boasts an “amazing spring flower display,” during which branches are smothered with star-shaped floral bracts that open lime green and quickly change to creamy white. Bright red, strawberry-like fruit decorate the tree until fall, when striking red leaves finish up the seasonal show.